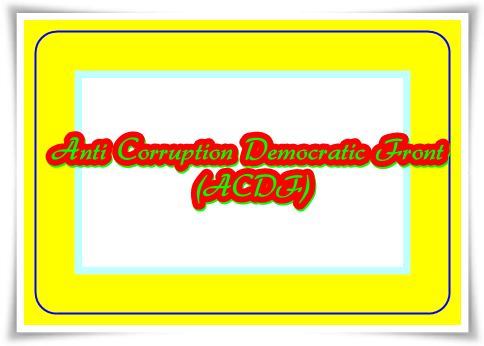 Anti Corruption Democratic Front (ACDF), a new organization to fight against the unjustifiable corruption which cripples the development of Kerala has been formed. Chief whip and Kerala Congress leader P C George will be the chairman while BSDP Vishnupuram Chandrasekharan, DHRM leader Saleena Prakkanam and Dalit leader Kuttappan Chettiyar are placed in key positions. The main aim of this organization is to fight against corruption and stand for the progress of the marginalized people in the society. Anti corruption campaigns and thoughts which are propagated to fight against bribery have always got heart full support from the common people. Even though most of the political parties have tried to give promises during the election time regarding the eradication of corruption, less happened from considering the previous experiences. The initial success of Aam Admi Party can truly be connected with the new wave thoughts generated in the minds of the youngsters in India. After a short period of time, a new-fangled thinking which sparked in the minds of a few politicians in Kerala has given birth to a new organization which aims to fight against corruption and stand for the progress of the marginalized people in the society. Named Anti Corruption Democratic Front (ACDF), this new union of people aspires to fight against the unjustifiable corruption which cripples the development of Kerala has been formed. Chief whip and Kerala Congress leader P C George will be the chairman while BSDP Vishnupuram Chandrasekharan, DHRM leader Saleena Prakkanam and Dalit leader Kuttappan Chettiyar are placed in key positions. From the words of its creators, this organization is devoid of any political lineage but will be an anti-graft outfit for the common good. The first meeting of the Anti-Corruption Democratic Front (ACDF) will be held in Thiruvananthapuram to be attended by many influential leaders belonging to various sections. As this group is formed basically to fight against corruption in public life and focus more on social activities rather than political issue, there is no restriction on the membership. Being a conglomeration of 30 organisations in the state, the first meeting was held at the house of P C George on Tuesday as the day commences the 112th birth anniversary of K Kamaraj, former leader of Indian National Congress who had strongly fought against corruption. According to P C George, the highest body of the group will be a 300 member state committee while it will have committees in all the 140 Assembly segments and 14 district committees and also panchayat-level committees. Anti-Corruption Democratic Front (ACDF) will have a flag with two-third in blue colour and the rest in white with the short form ACDF adorned on it. Mr George has also expressed his ambition to conduct a rally of more than five lakh people in 2015 at Thiruvananthapuram.